Life habit: lichenized, not lichenicolous Thallus: crustose, areolate, contiguous; prothallus: black, mainly marginal, often indistinct areoles: round to angular, weakly convex, up to 1.4(-2) mm in diam. 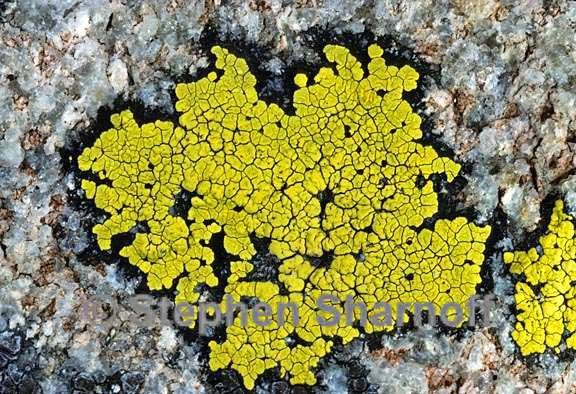 surface: bright yellow, smooth, dull, epruinose medulla: white, KI+ deep blue Apothecia: round or angular, up to 0.7 mm in diam. disc: concave to plane, epruinose exciple: pale brown epihymenium: brown, K- or K+ red, not containing crystals hymenium: hyaline or green, 150-220 µm tall; paraphyses: hyaline, clavate; hypothecium: pale brown, K- asci: clavate, 8-spored ascospores: hyaline or pale green-brown initially, becoming dark green-brown, muriform, ellipsoid, 32-60 x 15-22 µm Spot tests: medulla K-, C-, KC-, P+ yellow Secondary metabolites: rhizocarpic and psoromic acids. Substrate and ecology: on non-calciferous rock in open sites in coniferous regions, at 1475-3030 m, apparently rare World distribution: Africa, Asia, Europe, and North America Sonoran distribution: Arizona and southern California. Notes: In the present delimitation, Rhizocarpon macrosporum differs from R. geographicum only in the size of the spores. Intermediates do occur, but are rare. The present delimitation conforms more or less with Runemark's (1956a) R. macrosporum and R. sphaerosporum.